Press Release: July 28, 2018 by Sanman Promotions – Protagonists in the stacked 11th Brawl at the Mall card hurdled the initial test after making weights on Saturday noon, July 28, at Robinsons Mall in General Santos City. Jasur Akhmadjonov of Uzbekistan weighed 145 pounds, while his opponent for the eight-round duel Rodel Wenceslao from Cebu City logged 147 pounds. Another fighter from Uzbekistan Ulugbek Sobirov and his opponent Dennis Padua from Baguio both tipped the scales at 150 lbs. 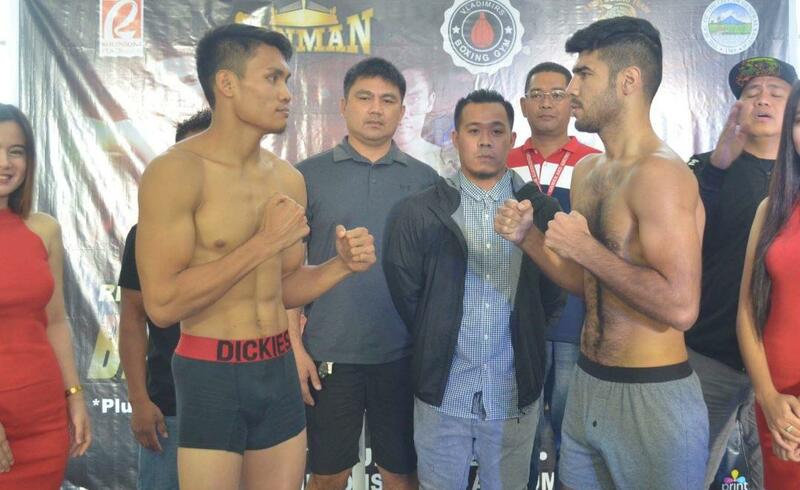 Another foreign fighter, Rajan Nadarajah weighed 120 lbs for four-round showdown with Davao’s Junrex Saldivia (124lbs). The card will start at 3 p.m. on Sunday, July 29, at the Robinsons Mall Atrium. Meanwhile, Jade Bornea of Sanman Amoy also showed his readiness to protect his unbeaten record after tipping the scales at 120 lbs. His opponent Alvin Bais also appeared in tip-top shape as he also weighed 120 lbs. The following are the weigh-in results for other bouts: Jerven Mama (116lbs) vs. Ryan Tampus (116lbs); Jerry Francisco (110lbs) vs. Gerald Alvarez (110lbs); Richie Mepranum (117lbs) vs. Rodel Tejares (118lbs); Adam Diu Abdulhamid (145 lbs) vs. Philip Parcon (142lbs); Judy Flores (118lbs) vs. Paolo Perono (120lbs); Virgil Deguma (126lbs) vs. Michael Padayag (124lbs); Presco Carcosia (128lbs) vs. Rey John Indita (132lbs); Ranjo Napoles (147lbs) vs. Ador Torres (145lbs). Material and Photo courtesy of: Sanman Promotions Used with permission. For more information about Sanman Promotions and to watch the Sanman Live Brawl At The Mall Boxing series please visit Sanman Promotions’ official Facebook page: www.facebook.com/SanmanPromotions.